This is a a crunchy, tasty, vegetarian salad. Full of great flavours, I particularly like the contrast between the beetroot and the goats cheese. Slice the beetroot into small cubes. Slice the cucumber lengthways with a potato peeler. 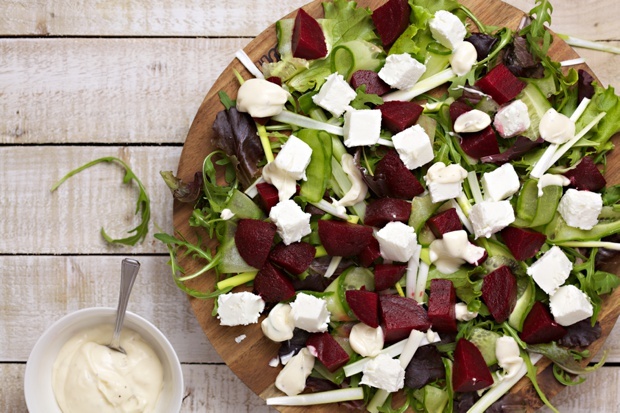 Arrange the salad leaves, beetroot, onions and cucumber on a platter, or plates. Cut the goats cheese into small pieces and dot over the salad. Sprinkle over with pecans and, finally, drizzle the dressing over the salad.